Seventeen years after it was first published to acclaim, Native has been reissued in a beautiful new edition from Bison Books, The University of Nebraska Press. "It is our good fortune that this novel will have an opportunity to reach a new readership. We would do well to remember that Native predates both Annie Proulx's 'Brokeback Mountain' and the real-life tragedy surrounding the death of Matthew Shepard. The themes played out in both those narratives, one fictional, the other all too real, are themes that William Henderson handles subtly and delicately in this strange and urgent and painful novel. If we want to understand the real story of the American West and meditate on the nature of our humanity and inhumanity, Native is as good a place as any to begin." "Henderson's moody, near mystical evocation of the Western heart owes more to the spirit of The Scarlet Letter than to Louis L'Amour. Native is a cowboy story unlike any other." "This is an original novel, a stereotype-shattering vision of the American West and its people." "An intensely American novel...finely wrought. With vivid, startling characters and a graceful evocation of the land and nature." 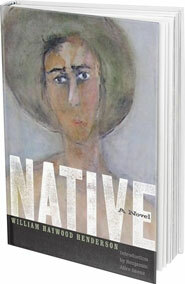 "Native is a thoroughly western novel about longing and about the implied promises of the landscape to answer the longing of solitary, gay men who simultaneously yearn for isolation and connection. . . . It is the complexity, the pain, and the ambivalence of these men that make Henderson's Native compelling." "William Henderson is quite simply the best young writer I know about in America right now." "I have never seen the American cowboy and his natural environment so intimately drawn. Henderson's poetic hand slowly, surely, reveals to us the mystery: as we are the caretakers of the earth, so then we are, indeed, the caretakers of our souls." "With Native, Henderson instantly joins the company of [Edward] Abbey, Tom Spanbauer, and Larry McMurtry as a writer with a unique and compelling vision of the modern West and a talent to put that vision into words." "Dazzling ... reveals the gift and power of an exceptional writer." "Beautifully recounts the story of a man's loss of home, occupation, and friends because of the given circumstances of his life. It is a subtly written tale, carried off with great finesse." © 2015 William Haywood Henderson. All Rights Reserved.